If you want to replace your sink and need a plumber in the Phoenix area feel to call us today. We are a safe, friendly, locally owned and operated residential plumbing company with excellent reviews. If you’d like to do it yourself, read on for some tips. If you’re going to replace your sink, first measure the old one. 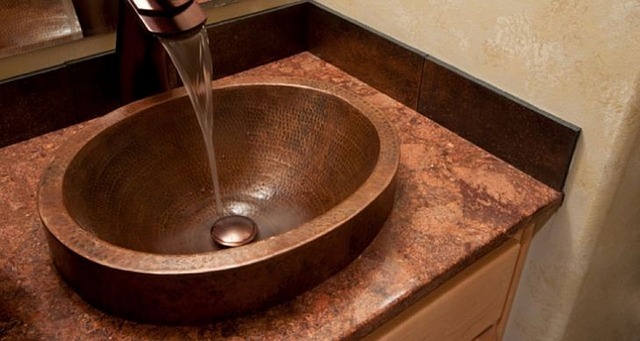 If your new sink isn’t going to be the same size, you’ll need to make some modifications. Once you’re clear on that, let’s move on. Pro tip: take a picture of your plumbing before you take it out. You may be glad you did. To get rid of the old one, you need to turn off both water lines. The controls are typically under the sink in a cabinet but if you have a pedestal type sink they’ll be visible. If you can’t find them you can always cut off the main line to the house. This is a nice time to have a bucket by the way, because you may get some drippage. Turn on the faucet to drain the lines of any remaining water pressure (if you don’t do this you’ll get something like you see in cartoons where the water shoots up into your face). You’ll need a wrench for the next step – to disconnect the water supply lines to the faucet. You may have a garbage disposal – if so, go to your circuit breaker and a) turn off the circuit, and then b) unplug the disposal. As you probably can guess, you want to make sure A comes before B. Otherwise your next letters may be DOA. Don’t put your bucket away! You can use it here to catch any water you might have. Since you kept the manufacturer’s instructions, follow them to remove the disposal. You say you didn’t? Good thing this is the Internet age. Do a search for your product manual and you can also look on YouTube. Odds are you can find what you need. You may also have a dishwasher. If so, uncouple the dishwasher drain line. As always with any DIY project, make sure you keep the parts carefully organized and out of the way. You know that nice big doggie you wanted? Yeah. Don’t go there. Put your bits and pieces in a safe place. You’ll find some metal clips under the counter around the outer edge of the sink. Take ‘em out. Your sink will be carefully caulked. Take a razor blade kit and carefully cut under the lip. Push up from underneath and voila! It’s out. Now for the grime and mess. Get a putty knife and scrape it away. If there are any parts you’re going to reuse, then it’s a great time to clean those as well. Out with old, in with the new: put your new sink in the hole and make sure that it fits. You can make any necessary modifications (like for a soap dispenser, etc). Pull it back out and put the clips on. Install your new (or old) faucet and all the necessaries. Put a small bead of putty around the drain strainer and push it in place. Push it hard! Make sure it’s a tight, even fit. Tilt it up and put the rubber gaskets and threaded flange in place on the bottom of the newly affixed drain. Details count: wipe off any excess putty. If you do have a garbage disposal, just reverse the process and put it back on. Time for adventures with silicone – run a bead around the edge of the basin. Then carefully lower it into the opening, making sure to set it in correctly and firmly. Go underneath and twist those metal clips to the outside and then tighten them. It’ll either be nuts or screws. Just make sure they’re set. Next up: reconnect the water lines. You won’t be happy if you over tighten them. Reassemble your disposal if you have one, following your owner’s manual directions. Connect the disposer pipe to the sink drain pipe, then reattach the P-trap. Put some sealant all they way around the sink. You don’t need water leaking down. When you’re all set, run the disposal and then the dishwasher. Check for leaks! If you’re all good, then pat yourself on the back: you are a DIY God. On the other hand, if you’re in the Phoenix area and don’t want to follow these directions or find them challenging, call us. We’ll be happy to install your new sink.